Irish Examiner – a day in the life. Home / Press / Irish Examiner – a day in the life. Irish Examiner – Day in the Life. 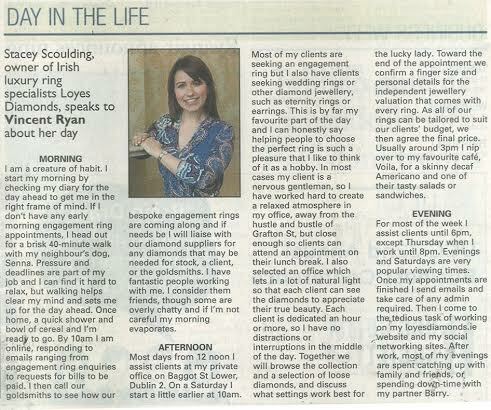 Stacey Scoulding, owner of Irish Luxury ring specialist Loyes Diamonds, speaks to Vincent Ryan about her day. I’m a creature of habit. I start my day by checking my diary for the day ahead to get me in the right frame of mind. If I don’t have and early morning engagement ring appointments, I head out for a brisk 40 minute walk with my neighbor’s dog Senna. Pressure and deadlines are part of my job and I can find it hard to relax, but walking helps clear my mind and sets me up for the day ahead. Once home, a quick shower and a bowl of cereal and I’m ready to go. By 10am I’m online, responding to emails ranging from engagement ring enquires to requests for bills to be paid. I then call our goldsmiths to see how our bespoke engagement rings are coming along and if needs be I will liaise with our diamond suppliers for any diamonds that may be needed for stock, a client, or the goldsmiths. I have fantastic people working with me. I consider then friends, though some are overly chatty and if I’m not careful my morning evaporates. Most of the days from 12 noon I assist clients at my private office on Baggot St lower, Dublin 2. On a Saturday I start a little earlier at 10am. Most of my clients are seeing an engagement ring but I also have clients seeing wedding rings or other diamond Jewellery, such as eternity rings or diamond earrings.. This is by far my favorite part of the day and I can honestly say helping people to choose the perfect engagement ring is such a pleasure that I like to think of it as a hobby. In most cases my client is a nervous gentleman, so to create a relaxed atmosphere in my office, away from the hustle and bustle of Grafton street but close enough so clients can attend and appointment on their lunch break.. I also selected an office which lets in a lot of natural light so that each client can see the diamonds to appreciate their true beauty. Each client is dedicated an hour or more, so I have no distractions or interruptions in the middle of the day. Together we will browse the collection and a selection of loose diamonds, and discuss what settings work best for the lucky lady. Toward the end of the appointment we confirm a finger size and the personal details for the independent jewellery valuation that comes with every ring. As all our rings can be tailored to suit our clients budget, we then agree the final price. Usually around 3pm I nip over to my favorite café Voila, for a skinny decaf Americicano and one of their tasty salads or sandwiches. For most of the week I assist clients until 6pm except Thursday when I work until 8pm. Evenings and Saturdays are the very popular viewing times. Once my appointments are finished I send emails and take care of any admin required. Then I come to the tedious task of working on my loyesdiamonds.ie website and my social network sites. After work, most of the evenings are spent catching up with friends and family, or spending down-time with my partner Barry.